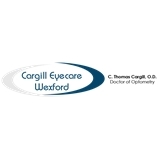 Cargill Eyecare Wexford (Wexford) - Book Appointment Online! Welcome to Cargill Eyecare Wexford in Wexford. Residents of the Wexford area rely on Dr. Cargill’s more than 30 years of experience. Your referrals keep us growing. We invite you to browse our website to learn more about our optometry services, and invite you to join our patient family by scheduling an eye exam appointment at our Wexford office. Cargill Eyecare Wexford is a full service eye and vision care provider and will take both eye emergencies as well as scheduled appointments. Patients throughout the Wexford area come to Cargill Eyecare Wexford because they know they will receive the personal attention and professional care that is our foundation. Dr. Cargill and our team are dedicated to keeping our patients comfortable and well-informed at all times. At Cargill Eyecare Wexford, we will explain every exam and procedure and answer all of our patient's questions. Dr. Cargill and staff are always friendly and knowledgeable. They make you fee like an old friend every time you're seen. I recommend them to family and friends all the time.